Any excuse to visit Caroline at Cakes The Biscuit and eat her deli­cious glu­ten free cakes is fine by me. I have had the pleas­ure of meet­ing Caroline once before and on that occa­sion I tried a glu­ten free cup­cake. As soon as I bit into the cake I was taken back to my child­hood, my mum’s kit­chen and beau­ti­fully baked homemade cakes. I knew then Caroline was no ordin­ary baker. So, when she agreed for me to write a review on her homemade glu­ten free delights I was over the moon and wasted no time ask­ing her to bake a selec­tion of her cakes and pastries for me to try! I now find myself back in Caroline’s kit­chen sit­ting oppos­ite a truly mag­ni­fi­cent dis­play of cakes, pastries and short­bread. I find sit­ting on my hands helps to pre­vent me from steal­ing the lot and politely wait until I am offered a cake of my choice! I waste no time in choos­ing a piece of milk chocol­ate and hazel­nut short­bread. Shortbread is high on my list of ‘must‐haves’ for Amélie, I quite simply love short­bread and I am determ­ined that Amélie will share the exper­i­ence. Here goes, my first bite – WOW! I hear the crunch of the sugar, then, as I effort­lessly bite through the soft, doughy centre I close my eyes and enjoy the dis­tinct but­tery taste of ‘real ’short­bread. Each mouth­ful just gets bet­ter and bet­ter, as this has the added delight of con­tain­ing milk chocol­ate and hazel­nut, a fant­astic com­bin­a­tion of sweet­ness and crunch! So who is this won­der­ful Gluten Free baker? Well, Caroline is no stranger to Coeliac Disease. Diagnosed when she was only 8 months old, Caroline has spent all her spare time try­ing to per­fect her own glu­ten free cakes, pastries etc. Caroline’s exper­i­ence does not stop there, she is also a fully‐trained chef and she recalled how she always seemed to end up work­ing on the pastry sec­tion. Amongst the many places she has worked includes the diet kit­chen in the Bath Royal Unit and as the Assistant Catering Manager at Westminster Boys School, London. On her return to Bristol she took time out to have her daugh­ter and then in 2010 began to sell her glu­ten free cakes. Caroline will only use loc­ally sourced eggs and but­ter in her cakes, she bakes with Doves Gluten Free flour and is very pas­sion­ate about using sea­sonal fruits. 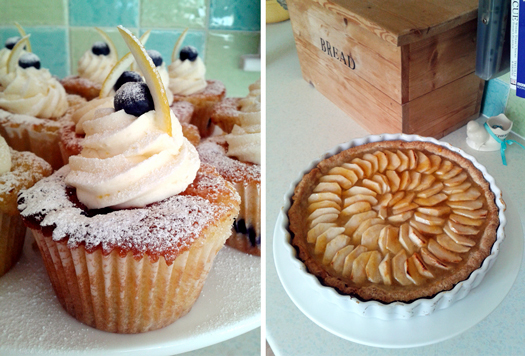 You can cur­rently buy Caroline’s cakes from Mrs Brown’s Café in Victoria Park, Bristol. Caroline hap­pily tells me of her first encounter with the café. She took along a few samples for Emily (Mrs Brown) to try and couldn’t believe it when Emily asked for a couple of batches straight away! Customers at the café are often sur­prised to find that the cakes are glu­ten free as they taste so good! Caroline hopes to expand her busi­ness by provid­ing glu­ten free cakes through local cafes/bakeries in and around Bristol. She also bakes beau­ti­ful birth­day cakes which can either be col­lec­ted or delivered. So, what are you wait­ing for? 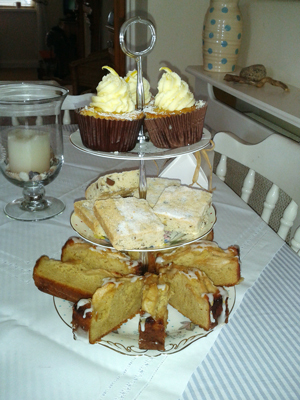 You really have to try these cakes either by vis­it­ing Mrs Brown’s Café or going to her web­site. Either way you will not be dis­ap­poin­ted! My aim is to find great tast­ing, qual­ity Gluten Free products. Cakes The Biscuit def­in­itely deliv­ers! No related posts articles for this post right now. Do you have a gluten-free product or service you would like us to review? We'd love to hear from you!